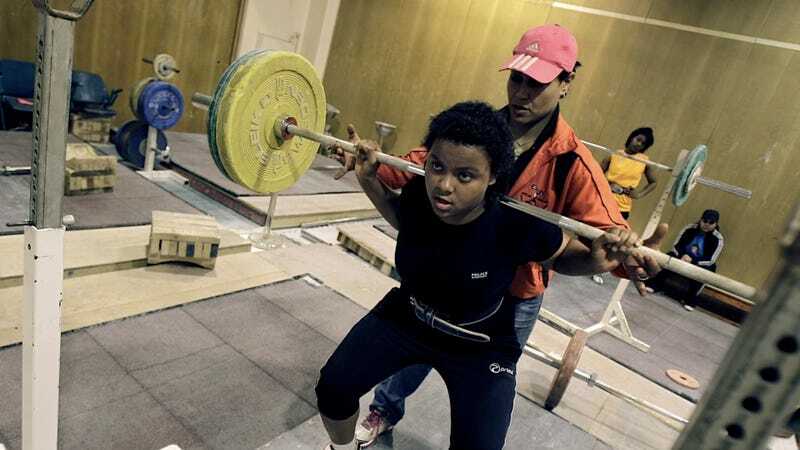 A 17-year-old girl named Khadija Mohammed will make history this summer when she becomes not only the first female weightlifter from the Persian Gulf to attend the Olympics, but also the first woman from the United Arab Emirates to qualify outright for Olympics. She'll be lifting in the 75-kilogram (about 165 pounds) category, and competing against seasoned veterans such Russia's Nadezda Evstyukhina and Svetlana Podobedova from Kazakhstan. Though expectations are low for Mohammed's first go-round (she's awfully young, even for an insanely strong prodigy), her trip to London will hopefully go a long way to legitimizing a sport that, for women in the U.A.E., is still stigmatized as "unnatural" and sorely underfunded. The AP chronicles Mohammed's two-year journey to Olympics, starting with marathon training sessions in the gym former Egyptian Olympic lifter Najwan El Zawawi established in the U.A.E. four years ago. El Zawawi says she could draw from only a small pool of girls whose families would allow them to participate in competitive lifting, a sport that many citizens in the conservative Gulf country confuse with bodybuilding, fearing that it, if girls participate, they will develop a more "masculine" form and consequently damage their marriage prospects. The U.A.E. weightlifting team did well enough at the Asian Weightlifting Championships in South Korea to earn a spot in the Olympics, an achievement that El Zawawi hopes will work towards changing some of the more intractable cultural prejudices against female weightlifters. This success is a great achievement for weightlifting and reinforces its ideals of inclusion and openness. The participation of Ms. Mohammed is a driving force to encourage more women to start practicing weightlifting not only within the Gulf Countries, but all around the world. It's a huge accomplishment for Mohammed to make the Olympics at such a young age, though she's probably under enough pressure without worrying about the wider cultural implications of her participation in this year's games.